Hair patch using glue (hair wig) is better or hair transplant surgery? If a grade of baldness is more than how is it possible to cover scalp? Can hair transplant be done after the age of 60 years? Answers to all these questions can be explained very well by reading an interesting story of the patient whom hair transplant is done at Rejuvenate Hair Transplant Centre with excellent coverage of scalp. Previously he was using hair patch using glue and developed an allergy to this due to its long-term use and constant irritation. Redness and itching were so much that he was very much disturbed. He wants some permanent solution and hair transplant is done by FUE method. 8100 grafts were implanted in two sessions by using scalp and body as a donor source. He is very happy now after getting the best result of hair transplant. 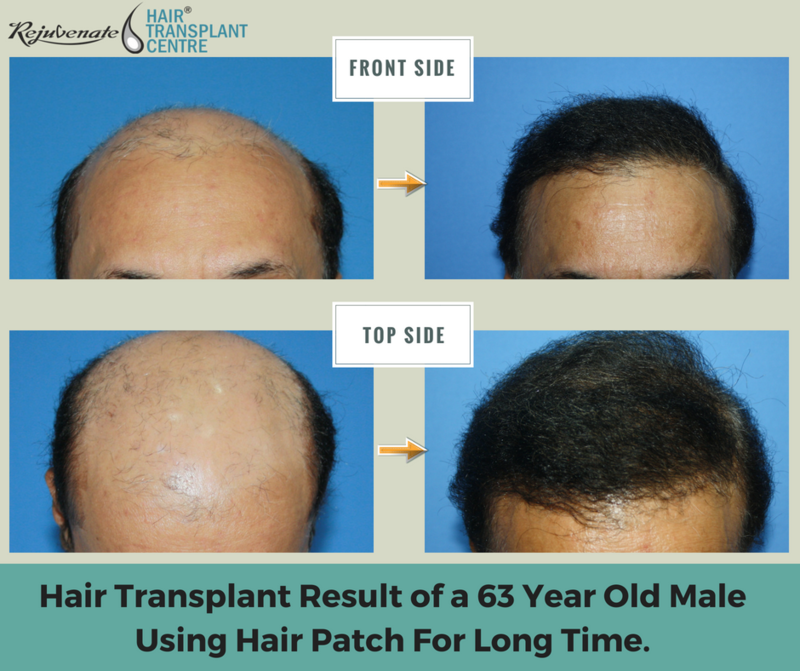 A 63-year-old man was using hair patch since last 20 years came to us for hair transplant. He was fed up with the patch and now wants permanent treatment for his baldness, he was grade 7 Norwood category. Though donor is narrow but has a good quality of hair. He has good beard and chest also. His general health was good. No history of Hypertension and diabetes and he was not on any medication. No significant past history. No drug allergy. His investigations were within normal range. For best result of hair transplant, we plan for Powered hair transplant along with “combination grafting” of scalp, beard and chest hair. (FUE + BHT).To provide nutrition to graft we use plasma as a graft holding solution, also we do direct hair implant, to minimize outside body time of grafts and prevent ischemic injury. No touch to root technique is used to prevent microtrauma to grafts. Scalp hair quality is exactly same as was on recipient area. Beard hair is thick so provide good volume. We mix them with scalp hair for good result. Chest hairs are comparatively thinner and they help in providing filling effect. We planned his hair transplant in two sessions at a 4-month interval. Each session was of two days. On the day of Hair transplant-Trimming of the scalp is done on the same day in the morning. After trimming Head bath is given with providing iodine scrub. After xylocaine sensitivity, local anaesthesia is given. In the first session, we took 3100 grafts from scalp on day 1 and 2000 grafts from beard on day 2. So total 5100 grafts were implanted in the first session and this covered his frontal and mid-scalp region. In the second session, after 4 months we took grafts from scalp, beard, and chest. We advise trimming chest hair 12-15 days prior to surgery to avoid extraction of telogen hair. Percentage of telogen hair is maximum in chest hair if we compare it with scalp and beard. This will help us to extract anagen hair only as they will grow during this period. Beard hair should be trimmed 3-4 days prior to hair transplant. On day 1 we took grafts from 1000 grafts scalp and 800 from a beard. Now on the next day, we harvest chest and extracted around 1200 grafts. So we again able to harvest 3000 grafts in session 2. So in all, we had harvested 8100 grafts using Scalp, beard, and chest as a donor source. Usually, results start coming after 4 months of hair transplant procedure but at our centre, early results are seen because of Powered hair transplant and No touch to root technique for implantation. He got a very good result of the hair transplant because of putting a large number of grafts and avoiding all the factors which lead to poor growth of the hair root. So yes Hair Transplant Really works if done by qualified surgeons at well-equipped centre. FUE is the method which makes it possible to harvest grafts from other body areas like beard, chest, abdomen, and extremities. Good coverage can be obtained in a higher grade of baldness by combination technique ie mixing scalp hair with beard and chest hair. Hair patch using glue (hair wig) to cover baldness leads to various complications like allergy and redness. Hair Transplant should always be the preferred method unless otherwise contraindicated as in Cicatricial alopecia and in alopecia total. Hair transplant can be done at any age if a person is healthy and hypertension, Diabetes etc. are under control. If age is more than 60 years Fitness certificate for operation can be taken from physician or anesthetist.